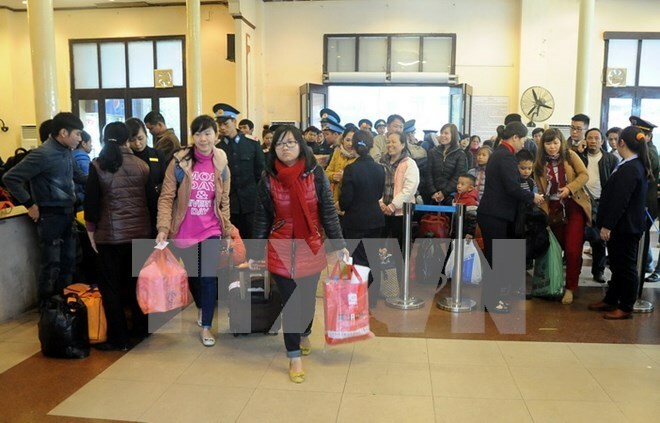 Hanoi (VNA) – Needy workers in the northern province of Hai Duong on January 31 received gifts and free bus tickets to return to their hometowns to celebrate the Lunar New Year (Tet) holiday. Under a programme launched by the provincial Confederation of Labour and the Golden Heart Foundation of the Vietnam General Confederation of Labour, 300 poor employees in Hai Duong were presented gifts worth 500,000 VND (22.5 USD), while 110 others got free bus tickets. The provincial Confederation of Labour has also instructed local trade unions to coordinate with businesses to aid 4,073 disadvantaged workers in the locality. Over the past two days, leaders in the northern mountainous province of Lang Son visited and presented Tet gifts to local armed forces, families of policy beneficiaries and poor households. By the end of January, thousands of gifts worth more than 11 billion VND (495,000 USD) had come to underprivileged people. This year, Lang Son received more than 5.1 billion VND (229,500 USD) from individuals, collectives, departments, agencies and businesses to support people living in difficult circumstances. The Mekong Delta province of Soc Trang has also handed over 6,000 gifts valued at a total of 2.5 billion VND (112,500) to Vietnamese heroic mothers and families of policy beneficiaries.